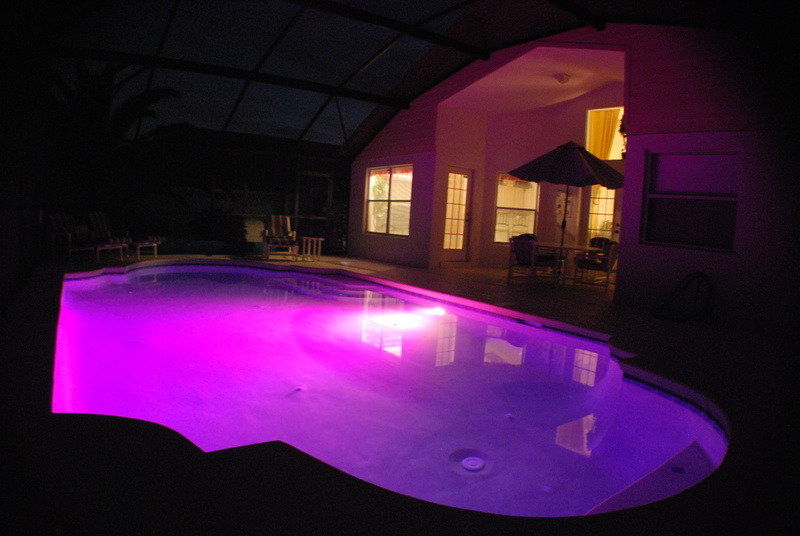 'The Palms' is a private and luxurious 4 bedroomed pool home accommodating up to 8 people and located in the prestigious Orange Tree community, just 15 minutes from the world famous Walt Disney Attractions. Our Villa is fully air-conditioned throughout with all modern facilities. The lounge has a vaulted ceiling with plenty of natural lighting and comfortable seating, where after a long day enjoying the local sights and attractions you can relax in front of our 42" LED Flat screen with full Cable television, DVD and Wii Station. 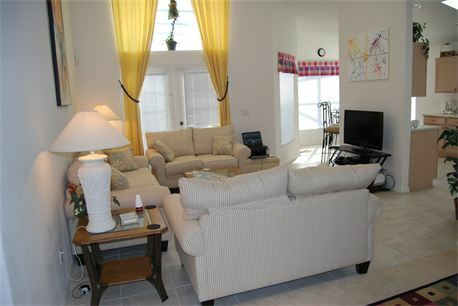 There is access from the lounge to the pool and to an extensive patio area via patio doors. There is free Wi Fi throughout the Villa. The Villa has four spacious bedrooms, two of which are Master bedrooms, both with en suite facilities. The first Master bedroom has a King sized bed, Cable TV, a double walk in shower unit, 'his and hers' sinks and a large roman Jacuzzi bath tub. 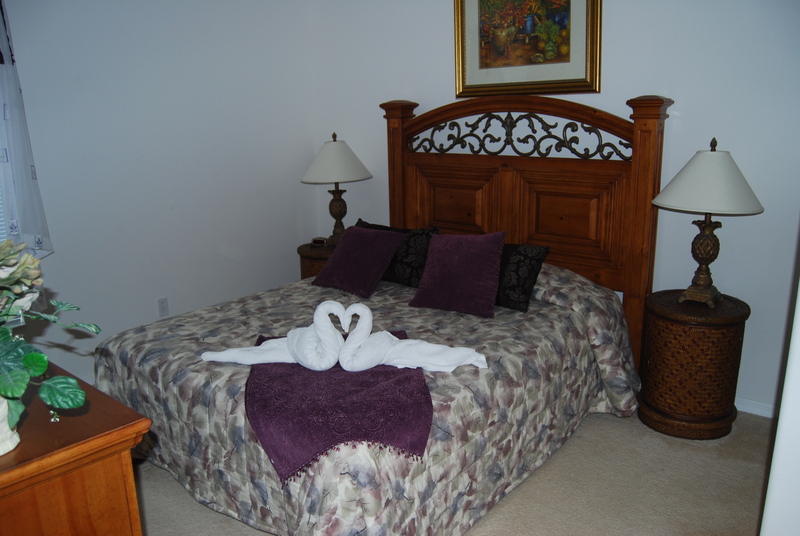 The second Master bedroom has a Queen sized bed, Cable TV and en suite facilities. 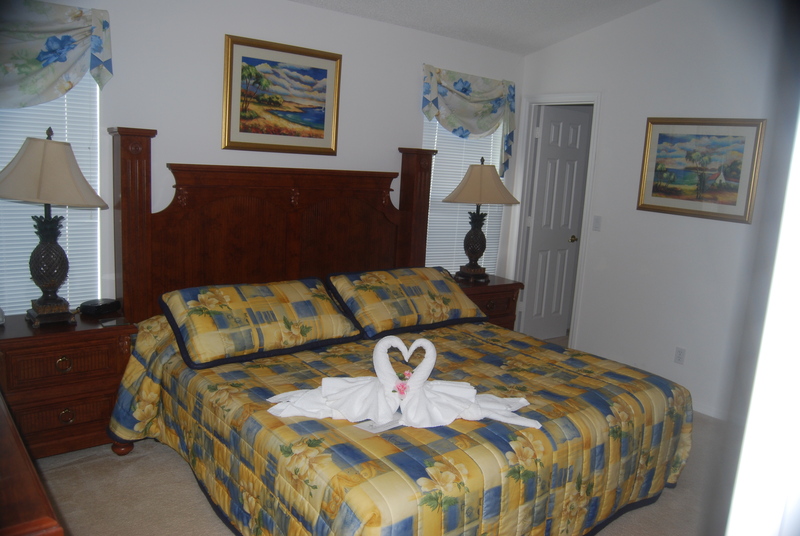 There are two further twin bedrooms, both with Cable TV, which share a bathroom with a bath and shower. One of the bedrooms has a play station the other has a CD Player and an I Pod docking station. The kitchen area consists of a cooker, microwave, dishwasher and fridge freezer and all other modern facilities and appliances expected from a luxury Villa. 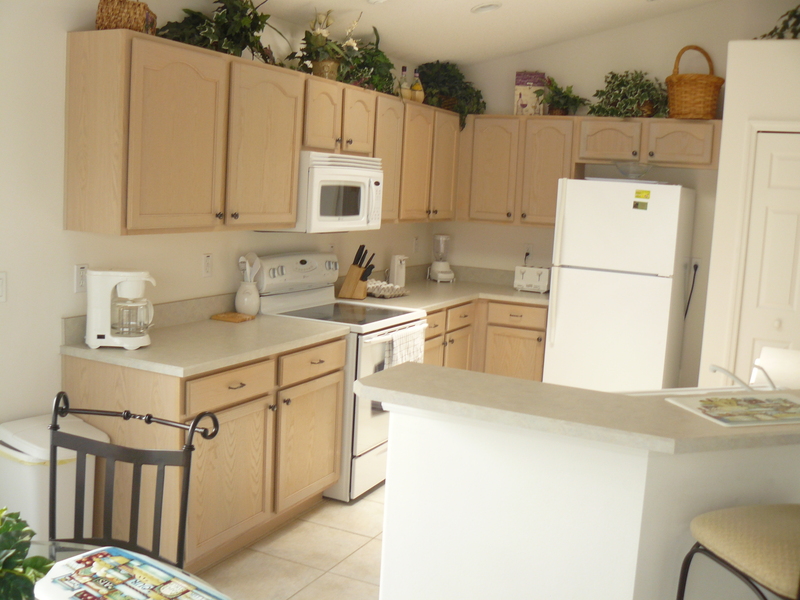 Next to the kitchen is a breakfast table with 4 chairs and a breakfast bar with 2 stools. 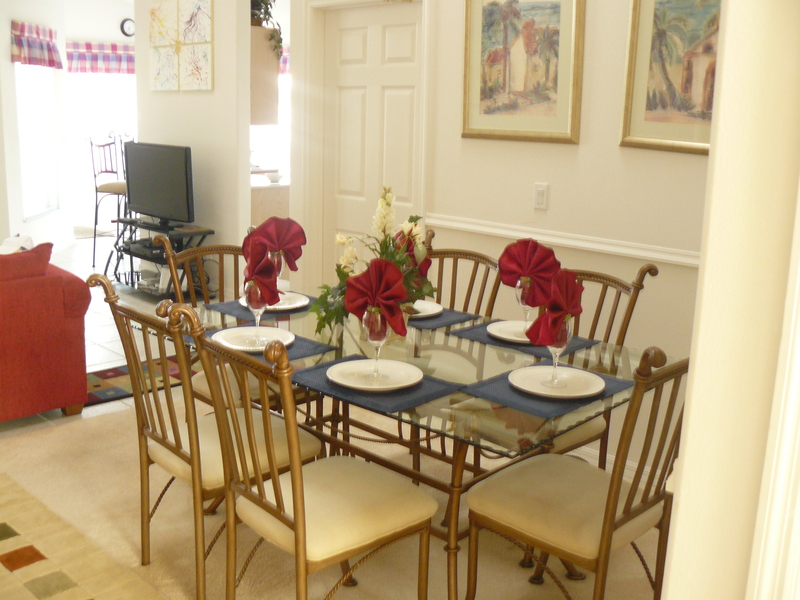 The separate formal dining area has a large glass top table and would seat six adults comfortably. Ideal for those formal dinner parties in the evening. We also provide a Childs Cot, a Highchair, Pushchair/Stroller and Car Seat completely free of charge. 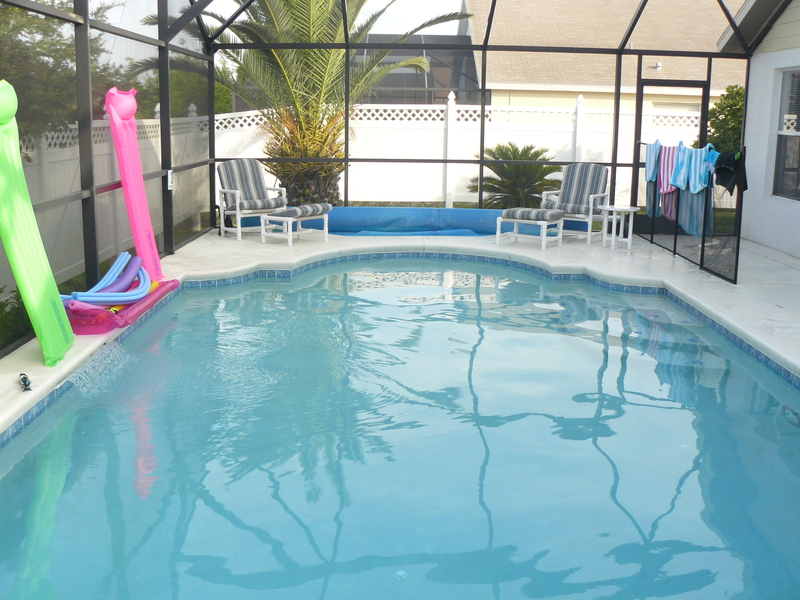 The large 'Oversized' 35ft x 15ft heated swimming pool is so inviting you will not want to leave it. 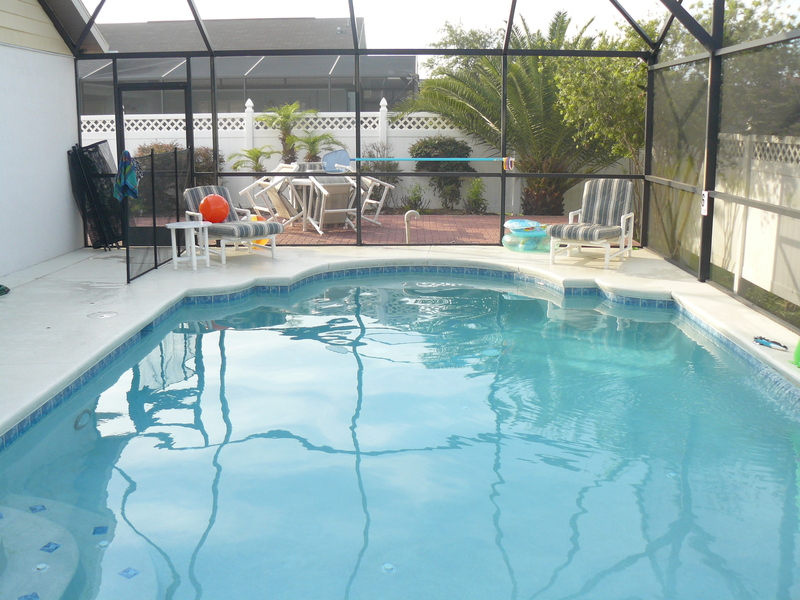 For your peace of mind there is a child safety screen to keep the little ones well away from the water. The screen is not intrusive and can be removed if you so require. We have provided a Patio table with parasol and chairs where you can enjoy your breakfast as the sun comes up or alternatively just to eat El-fresco in the evening whilst being calmed and entertained by the ever changing multi coloured fibre-optic Pool lighting. 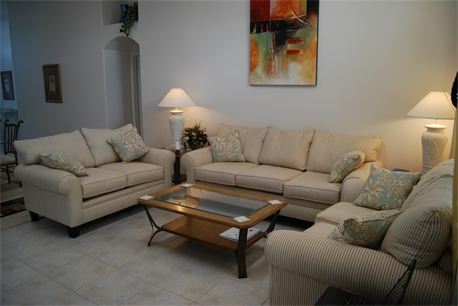 You will also find plenty of lounge seating to ensure that you can soak up the warm Florida sun or just relax and read a book. 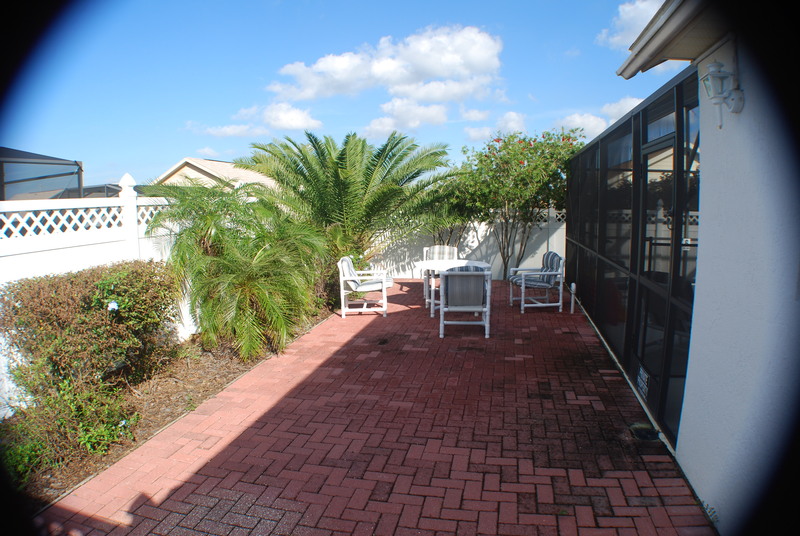 Outside the pool deck area is a large 400 square foot paved patio area and sun terrace ideal for those informal BBQ's or just full on 360 degree sun bathing. 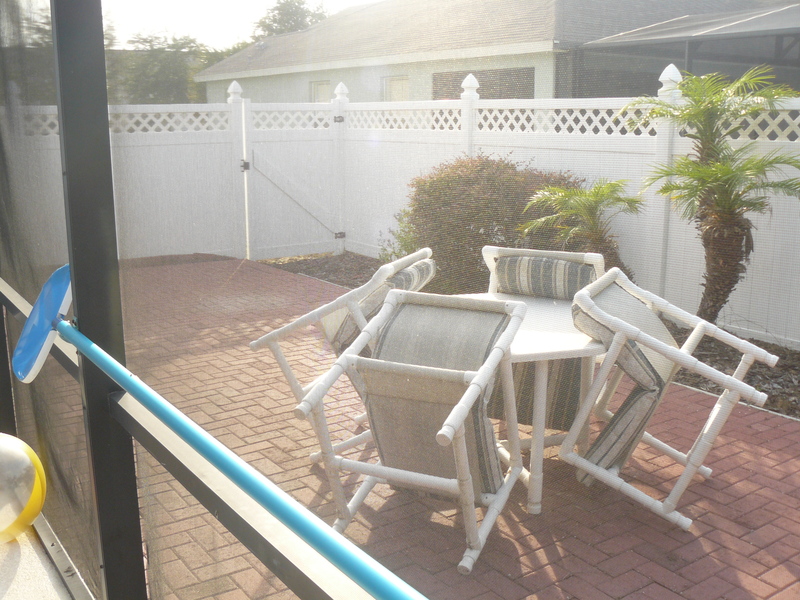 The rear of the property is totally enclosed with a 9 foot fence to ensure your complete privacy. 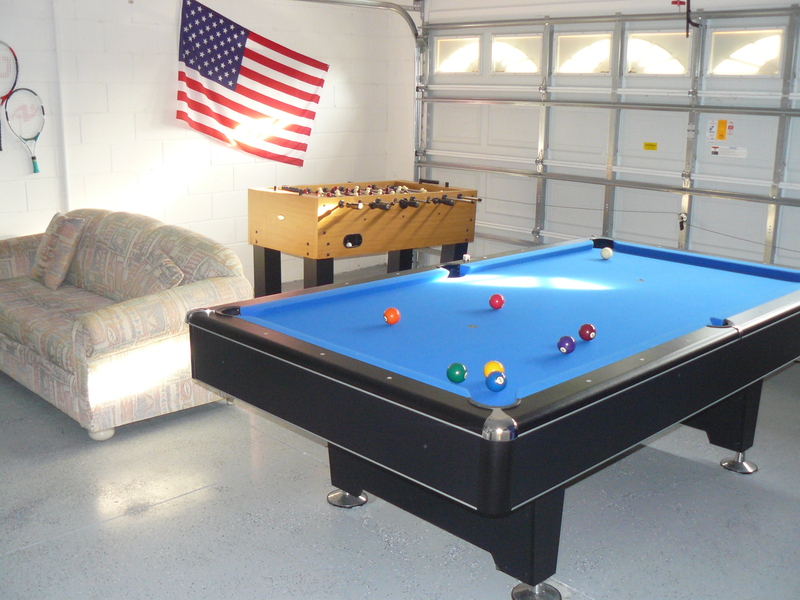 The games room houses a full size 8 foot, quality slate pool table and full size table football. We have also provided a table tennis table and bats together with a formal dart board and an electronic dart board game. There is also a ceiling fan with extra lighting to keep you cool during your frantic competitive games whilst enhancing your gaming skills. Orange Tree is situated in Lake County so by definition there are lots of water sports on offer in the area. Lake Louisiana State Park is just a 15 minute drive North on Highway 27 where you can (for a small fee) engage in boating and other water sports. We have provided three fishing rods/poles for those keen anglers to enjoy with all the fishing kit and accessories available at the local Walmart store just 5 minutes away from the Villa. If you are a keen golfer, you will find the Villa is ideally situated close to 35 Golf courses, including the famous Champions Gate Golf Complex just 15 minutes drive South on Highway 27. As a temporary resident of Orange Tree, you will also be afforded access to the wide range of facilities on the development such as the Basketball court, Tennis court, Soccer pitch and kiddies play park, all just a short stroll from the Villa. We have also provided 4 tennis rackets and balls, a basketball, football and volley ball for use at the recreation area. 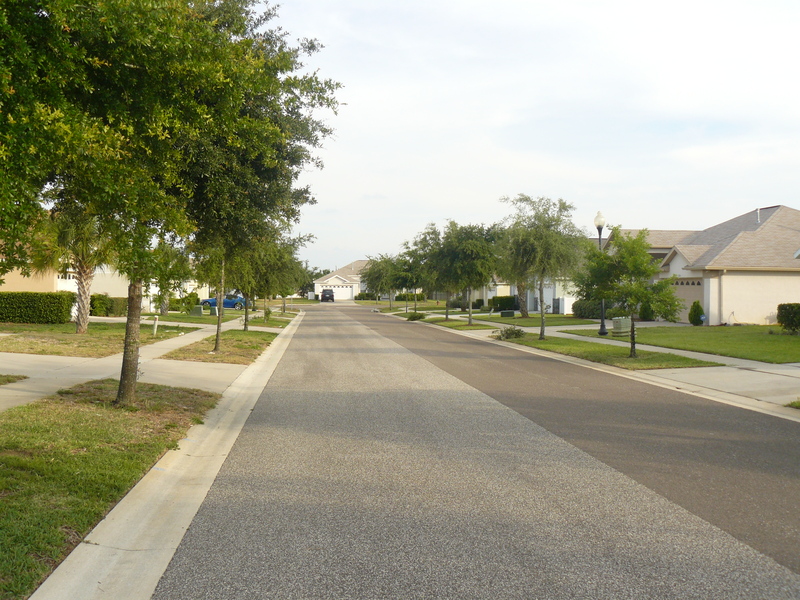 This fabulous community has its own five acre manicured grounds which include tennis courts, soccer pitch, basketball court and a super childrens' playground (Tot Lot). The whole area is surrounded by scented orange groves. The homes have all been constructed by the award winning builders Greater Homes, renowned for their excellent build quality. All homes stand on larger than average plots. Shops, supermarkets and restaurants are just a few minutes drive away with a brand new Wal-Mart Superstore less than three minutes down the road. 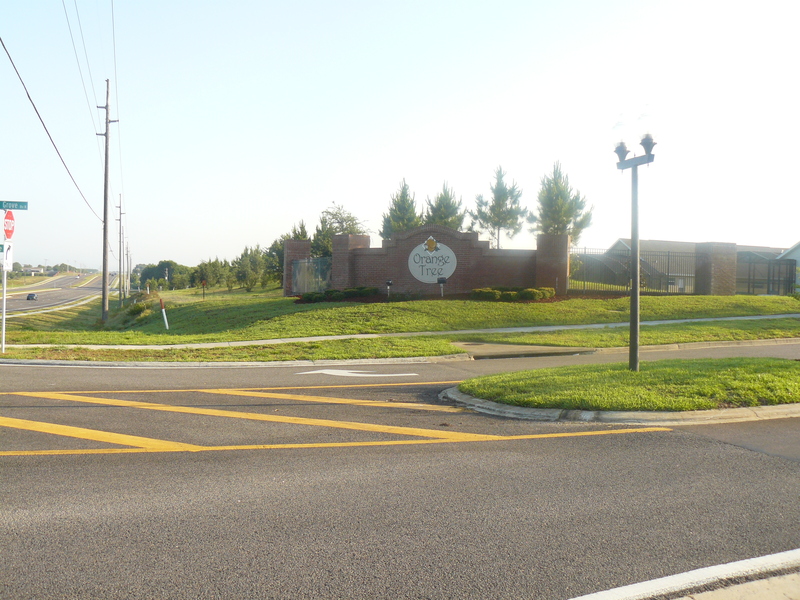 The community is very close to Lake Louisa State Park, a beautiful and really unique area within Central Florida. Rolling hills and scenic landscapes and lakes abound where visitors can swim, hike, bird-watch, picnic, fish, canoe and take part in the programmed nature study events. All manner of wildlife can be seen and enjoyed by all. If you enjoy golf you'll love Orange Tree. 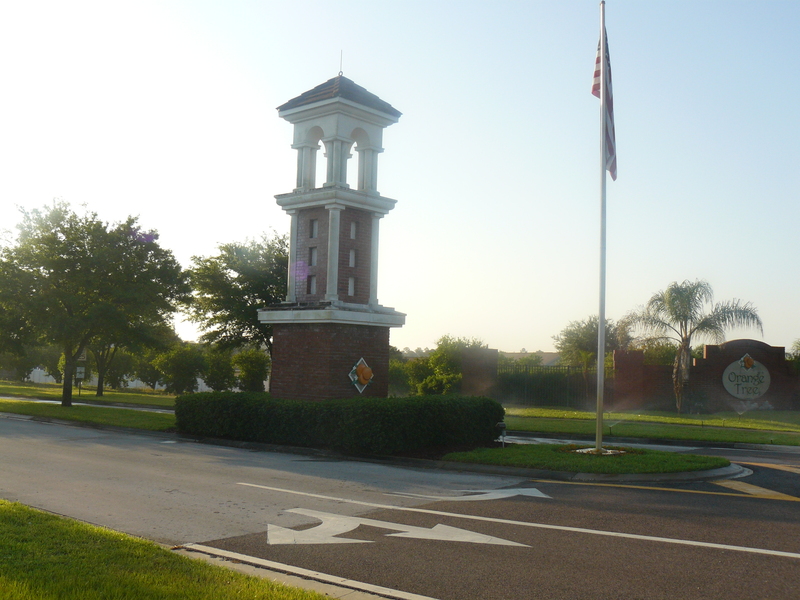 There are 20 golf courses within twenty minutes drive of the community including five championship courses in the Disney Resort area alone. Highlands Reserve Golf Club is less then 10 minutes away and boasts over 120 feet of elevation changes, making it one of the few hilly courses around. Most of the courses are open to the public, requiring no membership, only the payment of green fees. 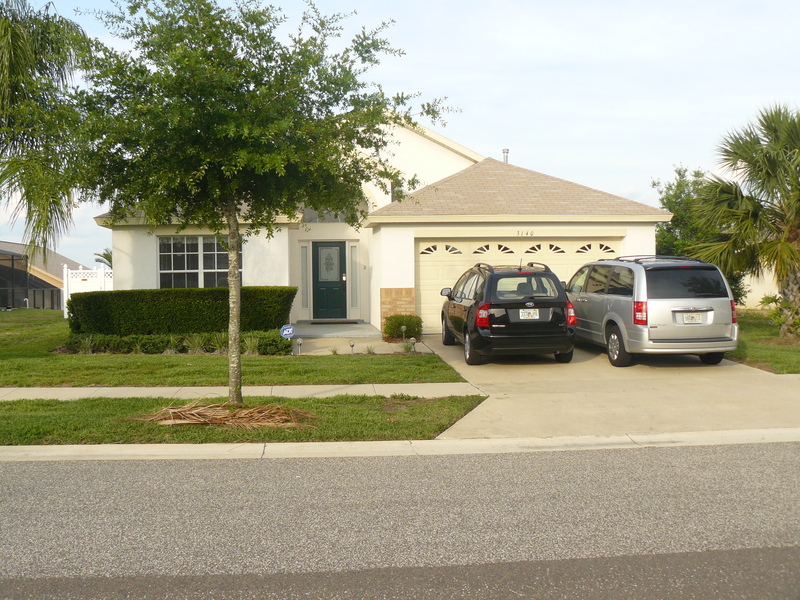 Orlando4Villas opinion, Orange Tree offers much for the family coming on vacation to the Orlando area. 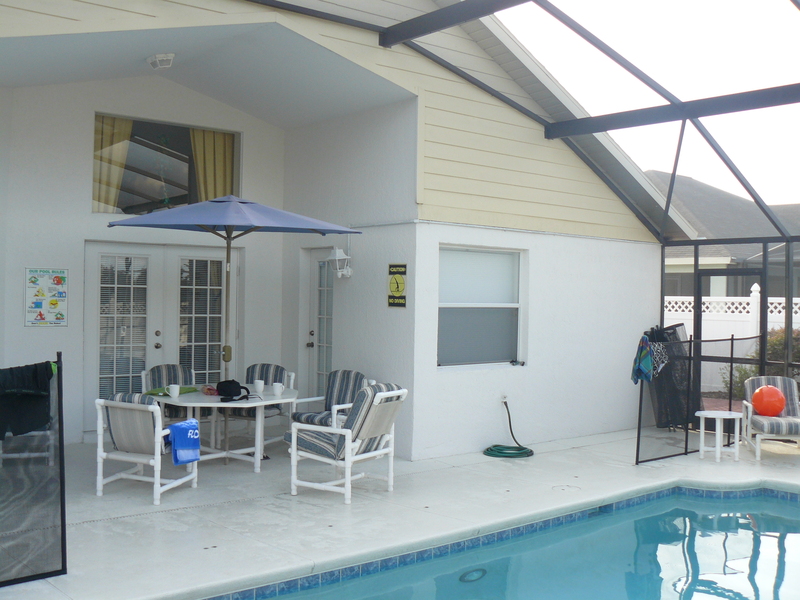 Orange Tree in Orlando, Florida is a delightful quiet community and an excellent choice for a vacation holiday home, Easy access to the Interstate 4 and Highway 192 makes this a great location for people on vacation throughout the Central Florida area. 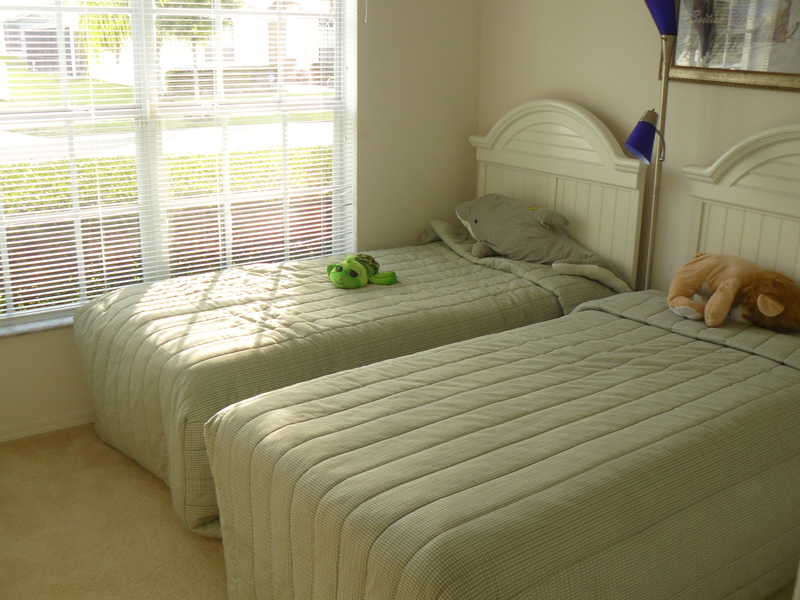 Orlando4Villas has the large selection of vacataion homes available for rent in Orange Tree.